We’re averaging half-a-dozen five-star reviews each and every workday! Not too shabby! We’ve got the best customers in the world, and we love hearing from them. Here are a few of our favorite 2018 customer reviews. 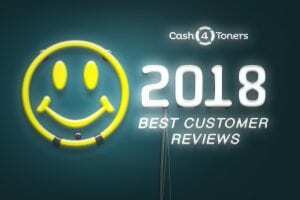 BEST PRICED PAY-OUT QUOTE I RECEIVED Cash4Toners gave me the highest quote and best payout for my toner cartridge out of 6 companies I tried! They offer to send payment to you through PayPal! They give the highest quote $ amount! They do not deduct for old style or messed up boxes! They only take new factory sealed items! They will even add $2 for every 1 item that you upload a photo for! They pay for the shipping! They will send you an email with the shipping label for Fed Ex. Thank you, Jackie! Can you write up our new website for us? Wait, I think you already did! Smart man, Robbie. 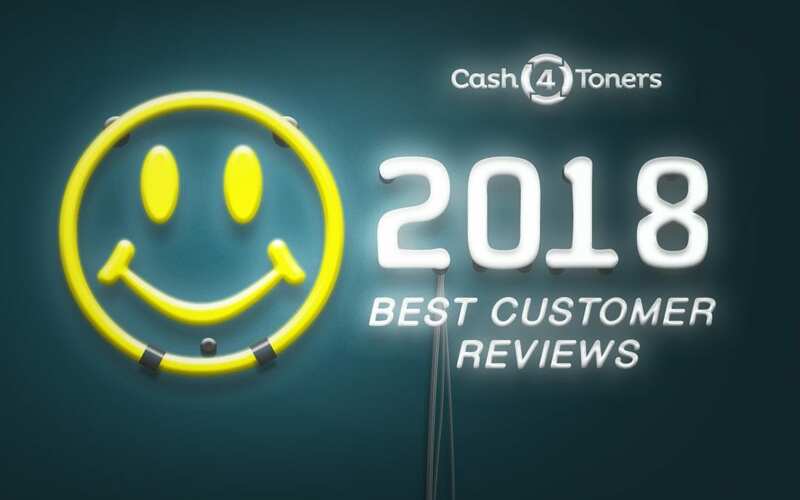 Glad to hear Cash4Toners not only measures up to the competition, but crushes it! We do what we say, Stephen, and we do it right! Thanks! A quick thank you, Randy! We’re easy like Sunday morning, John! Thank you, Riverbend! Keep on rollin’! Our fingers are on the button, ready to send you PayPal love, Urbano! We strive for perfection, Tvr S.! Thanks! We could not have been happier doing business with you, Dave! You’re the man! No, THANQ, Cassandra. We’ve tried to harness the speed of lighting for a while now. Getting there! Thank you, Steve! Our staff is SUPERBE! Superb too! Easy peasy, William! That’s how we roll here at Cash4Toners! Send us your toners by lunchtime, Bonnie, and we’ll get you paid before dinner!